2015 is a special year for development. It is the European Year for Development. For the first time the European Union focuses on the external action and Europe’s role in the world. Together with organzations in Europe the main goal is to inspire more Europeans to get engaged and involved in development and to explain how EU development aid works and demonstrate that it makes a real and lasting difference. 2015 is also the year in which the Millennium Development Goals that the world agreed to reach in 2000, and in which the international community will agree on the future global framework for poverty eradication and sustainable development – the Global Goals. World’s Best News has many years of experience in creating partnerships across NGOs, privat sector companies, the UN and Danida. 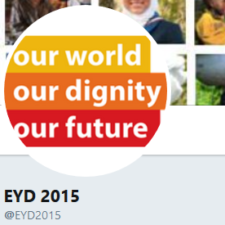 That is why World’s Best News and Global Focus have been appointed to contribute to #EYD2015. Across Europe, the Europeans will meet World’s Best News as weekly news, as Monday Myths on social media. And the yearly newspaper will not only be distributed in Denmark, but in a total of 19 European countries, with editions in 24 languages.